The Kent School of Architecture is proud to announce that its BA Architecture (Part 1) and MArch (Part 2) courses have been validated by RIBA for the next 5 years. BA (Hons) and MArch graduate Ana Becheru is one of five to be shortlisted for the British Expertise 2015 Young Consultant of the Year Award 2015. The British Expertise International Awards recognise and celebrate outstanding international achievements by companies in the UK professional services sector. Ana was delighted to learn of the nomination and said “it can only be a tribute to all my tutors’ hard work and dedication” and that all had made ‘a major contribution to her personal development’. 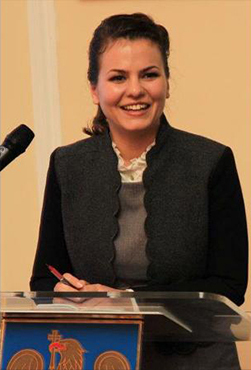 Whilst studying at the school, Ana was consistently involved in many projects including founding the League of Romanian Students Abroad (LSRS) UK Branch which has over 4200 student members. Professor Don Gray said “I am delighted to see Ana Becheru nominated for 2015 Young Consultant of the Year – this says much about the wisdom of those responsible for shortlisting. At Kent School of Architecture (KSA), Ana was an irrepressible ball of energy who wanted to get the most from her time with us. She was active in many areas in the School and University and beyond. Everyone in KSA wishes her the best of luck on 14th April at the final presentations in the Royal Garden Hotel in Kensington”. Good luck to Ana for the final selection which is being held in London on the 14th April 2015.